We are celebrating National Library Week with an open house. We will have cookies, coffee and tea, and everyone is invited! 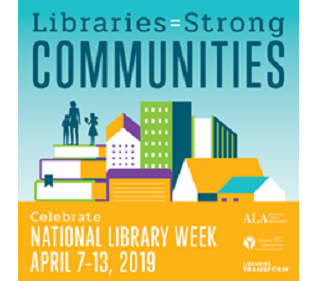 April 27th 1:00 – 2:30 p.m.
All current and former volunteers, library patrons, and anyone who is interested in the library is welcome to come have a piece of cake and share stories about the various chapters in the history of the library and share ideas about future chapters of our story. This is the first in a series of Leadership Workshops hosted in collaboration with the Bull Shoals White River Chamber of Commerce. The Google training with introduce Gmail and working with the Google Drive. We will have a mobile computer lab from the Arkansas Library Association available for participants to use, but if they prefer to bring their own device, that is fine too.